Just days after the Rangers announced the extension of their franchise goalie they also locked up two of their young defensemen for the next couple of years. Dan Girardi and Fedor Tyutin, linemates on the ice, both signed multi-year extensions over the weekend. 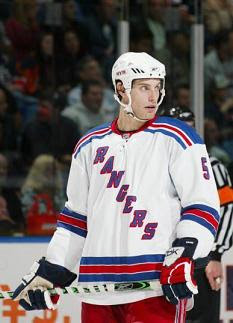 Girardi was the first to re-up when signed a two-year $3.1 million extension on Saturday that will pay him $1.5 million in 2008-09 and $1.6 million in 2009-10. 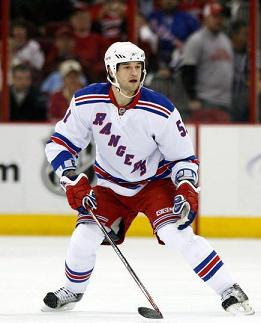 Then Tyutin received a four-year $11.4 million deal on Sunday which will keep him on Broadway through the 2011-12 season. Girardi, 23-years old, got quite a raise from the $550,000 he was making this season, but $1.5 million is still not bad for a second-pair defenseman whose skills are likely to increase. "I'm really happy about it," Girardi told Newsday. "I wasn't worried about it; I let my agent handle it. I'm not thinking about those two years right now; it's getting into sync for a good playoff run." Tyutin, 24-years old, is getting an even nicer raise from the $1.025 he is making this season. $2.85 will obviously be a decent cap hit, but many teams have expressed interest in the defenseman with the powerful hip-check as the trade deadline draws closer. So the Rangers would rather lock him up now than risk receiving an offer-sheet for him during the off-season. "It feels good when somebody wants to keep you and they rely on you," Tyutin said in the NY Dailynews. "I just have to keep playing my game and improve and prove that they made the right choice." With these deals in place the Rangers now have a young core of defenders, Marc Staal, Tyutin, and Girardi, locked up for the next couple of years. This will make it easier for Glen Sather to concentrate on who to add or subtract through trade without worrying about who is going to be on the blue-line next season. The deals do make less likely that the Rangers will resign Michal Rozsival during the off-season. The Rangers were already short of cap space before they threw money at Henrik Lundqvist last week and resigned the pair of defenseman. Now they will be hard pressed to find the space needed to sign Rozsival to the $4-6 million deal he'll be looking for as a first-line defenseman. Both Girardi and Tyutin were restricted free-agents who would be exposed to offer sheets this upcoming summer. The only other RFA that Rangers have at the NHL level are Nigel Dawes and Marcel Hossa. Brandon Shanahan, Sean Avery, Martin Straka, Paul Mara, Marek Malik, Rozsival, Jason Strudwick, and Steve Valiquette are unrestricted free-agents. Jaromir Jagr becomes a free-agent if he fails to reach 84 points and the Rangers fail to make it past the first round of the playoffs.